Settle in, Friends, because this is a very long post. I just spent the last four days working on it! I've gotten a lot of questions about the things we did to pay down our debt, so I thought I'd write a catch-all post here. If you've been reading for the last year, then this will probably be redundant, so you might want to skip over this post. But I'm going to try to write everything out here in one place. I know that people write blogs about paying down $40,000+ of debt in 6 months and other insane numbers like that; but that wasn't realistic for Jerry and me. 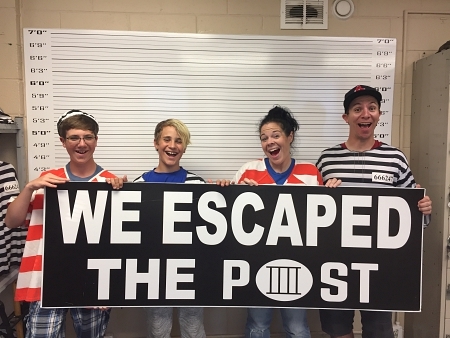 We didn't want to give up everything we enjoyed or feel deprived while we paid our debt, and we still managed to get it done in just over a year (without paying interest!). Before I get into the whole post, I just want to add that I'm not trying to tell anyone how they should do things--money-talk is very personal (so, naturally, I'm posting all about it on the internet! haha), and just like with my weight loss, what works for me isn't going to work for everybody. What I'm going to write about below describes how Jerry and I paid off our debt in a way that worked for us. We are happy with the way we did it, and I understand it's not for everyone. The cost of living varies tremendously depending on where people live, too, so my costs aren't going to be the same as others'. Finally, I don't agree with judging others for how they choose to spend their money. You'll see below that Netflix is written into our budget--of course Netflix isn't a necessary expense, but we don't have cable and we enjoy Netflix, so it's worth it to us to spend $11 per month on it. So, if you disagree with our choices, please just do so respectfully. I'm very proud that Jerry and I were able to pay off our debt! 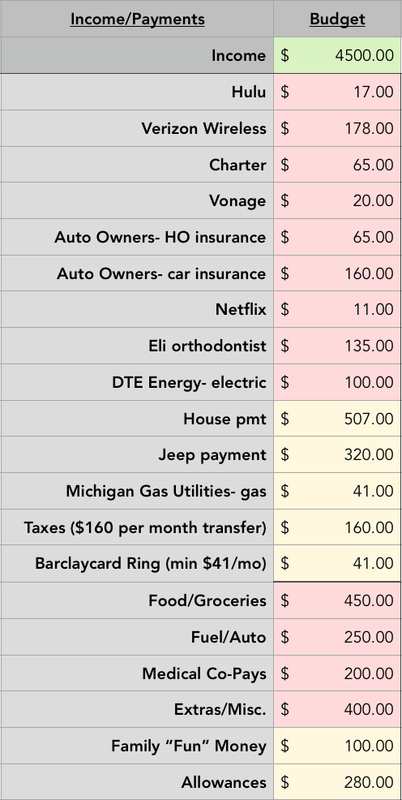 After totaling our debt and seeing that it was just under $14,500, I needed to make a budget plan. We were paying on three different cards, and I wanted to try to get all of the debt onto one card (for the sake of simplicity) and reduce/eliminate interest. I found a card (Barclaycard Ring) that offered 1) a $0 balance transfer fee (so, I could transfer my other cards' balances to this one without any fees); 2) no annual account fee; and, best of all, 3) 0% interest for 18 months! Thankfully, I have always had excellent credit, so there was no problem opening that card. I knew my credit score would take a small hit for opening a new card, but I figured it was worth it in the long run to eliminate interest. As soon as my card arrived in the mail, I cut it up and threw it away. I didn't plan to acquire new debt on it--I just used it for the balance transfers. After the balance transfers, I had 18 months to pay off debt without having to pay interest. I wasn't sure how long it would take us to do it, but after calculating our budget plan (below), I saw that it was very possible to get the whole thing paid off in time as long as we stuck close to our budget. Jerry and I have a very varied income--meaning we don't earn the same amount of money every week or every month or even every year. Jerry's income varies by how much overtime he works, whether he's filling in as a supervisor, what shift he's working, etc. My blogging income depends on what time of year it is, how many page views I get, how frequently I'm writing, if I've done any sponsored posts, etc. So, traditional budgets have never worked for us. We can't divide up cash every week and use only cash on purchases. After lots of scouring the internet, I settled on a "Zero Sum Budget". To do the Zero Sum Budget, we start each month with the amount of money to cover all of that month's expenses: all bills, groceries, medical expenses, gas, and "extras" (things like wedding/grad/birthday gifts, necessary clothing, field trip money for school, etc.). All of these expenses are called the "Bare Bones" amount needed per month. Because Jerry and I actually weren't in a huge hurry to pay off our debt, considering we weren't paying interest, we included Netflix and Hulu on the "bare bones" budget (even though they aren't a "necessary" expense). We also included "allowance", which isn't necessary but ended up being crucial to our staying on budget (I'll explain the allowance later). Basically, WE chose what our bare bones budget would be. Yes, we could have eliminated those unnecessary things like Netflix and allowances, and paid off the card sooner; but we didn't want to feel deprived and then quit altogether. It's like a diet--if you are too strict and feel deprived, chances are you won't stick with it. This totals $3500. Since our income varies so much, we aren't sure how much excess money we will have at the end of the month--but whatever that number is, it ends up going toward the credit card debt. For example: Let's say that we start July with $3500 (which is the goal of the Zero Sum Budget above--to start the month with the exact amount of the bare bones expenses). We use that money to pay for all that we need during July. Meanwhile, our income for July is being direct deposited in a separate account to be used toward August. Let's say that we earn $4500 in July. On July 31st, I would take $3500 of our July income and that would be the "bare bones" money that we would then use for August. That would give us $1000 left over from our July income. So, we would take that $1000 and apply it to our credit card debt, making our final income/expense balance $0 (which is why it's called a "Zero Sum Budget"). Then, we do it all over again. We start the month with that $3500 earned the previous month, and in the meantime, we accumulate our income throughout the current month to be used for NEXT month. This way, we start every month with the amount we need to pay our bills--it has been a huge relief not to have to worry about having enough money! We already have the money set aside for our bills, so there is no stress. The main goal is to not go over our budgeted $3500, because that means we would have less money to apply to our debt at the end of the month. A question I get asked often is how you get the first month's "bare bones" amount in your account to start the budget if you have no current savings. I'll answer that at the end of this post. We have two checking accounts, two savings accounts, and several (inactive) credit card accounts with a $0 balance. We used one of the credit cards while we were paying down debt, which I will explain below. Checking #1: This is our direct deposit account, where we accumulate our income. Jerry is paid bi-weekly (he was always paid weekly until a couple of months ago), and I am paid monthly (always at the end of the month). This account starts at $0 at the beginning of the month, and is strictly for deposits until the end of the month. Checking #2: This is where I pay all of our bare bones expenses from. I start the month with $3500 in this account. Savings #1: I transfer $160 per month from Checking #2 into this account for taxes. We pay summer tax and winter tax, and it totals about $1920 per year. When taxes are due, I withdraw the cash from this account to pay them. Savings #2: A savings account for a "just in case" scenario where we need money for a big "extra" expense--maybe our car needing a new transmission or something like that. We maintain $1000 in this account at all times. If we need to use any of it for some reason, then paying it back is our top priority. Credit Card #1: This card is used for as many monthly expenses as possible, including our bills. At the end of the month, we pay off the card in full using the budgeted money. We use the card in order to take advantage of credit card rewards (there are cards for travel rewards like SkyMiles, cash back rewards, groceries, gas, etc.). Note: If you don't think you'll have the discipline to stick to the bare bones budget, I don't recommend using a credit card while paying off debt. It can rack up the debt quickly! We stick to our budgeted amount as closely as we can and pay it off every month out of the budgeted $3500 "bare bones" account. If we go over budget (as you'll see we did by the example below), that money has to come from the extra income that would normally go toward debt--so we tried to stick as closely to the budget as possible. Here is July's budget and our actual expenses. It happened to be a month where we were very close to being on budget with everything. This was a HUGE factor in sticking to our budget. Each month, I withdraw cash for "allowance". Jerry and I each get $100 and the kids each get $40. This money can be used however we want throughout the month. I feel like this helps us stick to our budget because we don't feel totally deprived. We can spend money on stupid things that we want, without having to explain ourselves, but we also learned to ask ourselves if those things are worth it. Since we only had a certain amount each month, we were picky about how to spend it. A few people have asked how we handle online purchases with our allowance (because our allowance is cash). The kids are always wanting to buy things on iTunes or Xbox, and Jerry and I buy things on Amazon sometimes. To buy things online with our allowances, we just use our allowances to buy gift cards. So, the kids might buy iTunes gift cards with their allowances, and then they just apply the gift cards to their accounts and use that for their purchases. It requires some planning, but it keeps us from buying unnecessary things with the credit card and then forgetting to "pay it back". After the first few months, we also added a "family fun" amount to the budget ($100 per month). This can be used for us to do something as a family--going out to dinner, going to the movies, etc. This way we can still do fun things together as a family, but we don't have to spend our individual allowances for it. I was shocked when I started looking at the numbers of how much we spent on food each month prior to our budget. Several times, we spent over $1000 on food! It was insane. This is the category where we were overspending by a LOT--which is a good thing, because it's easy to make changes! 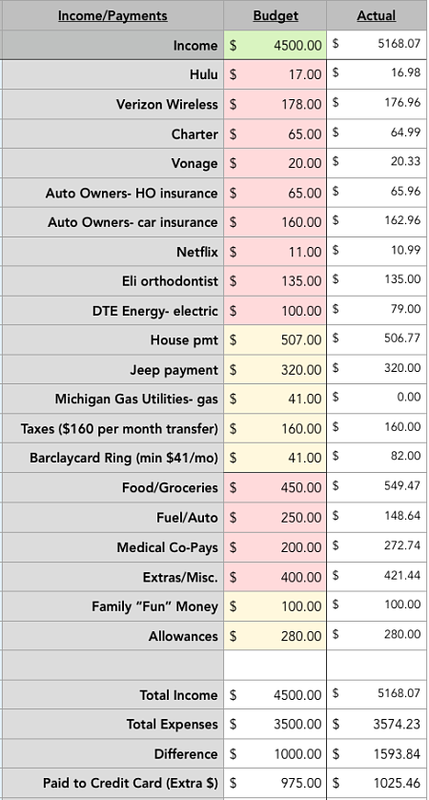 I set a budget of $450 per month, which is very do-able if we don't go out to eat (our family money is for dining out). To reduce our grocery expenses, I started checking sales and using digital coupons. The main way to reduce grocery costs (for us) is to make meals that require as few ingredients as possible. 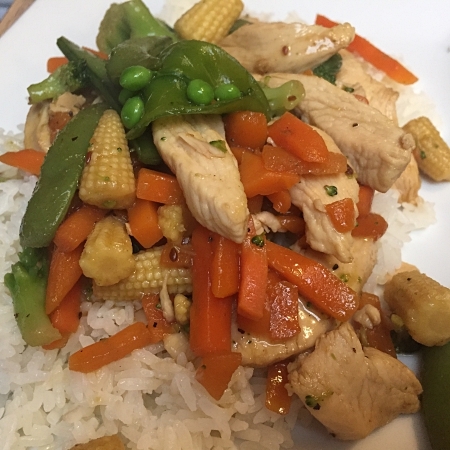 For example, a stir-fry (one of my family's favorite meals): instead of buying each individual vegetable for the stir-fry, I buy a bag or two of frozen stir-fry veggies (when they're on sale); a little meat goes a long way in a stir-fry, so I can buy a single chicken breast (about 1/2 pound) for the whole family--Kroger has chicken breasts for $2.99 per pound; and rice is super cheap! I also make my own stir-fry sauce (there are a thousand recipes online but we like to use the sauce from this General Tso's chicken recipe). So, we get a nice meal for less than $2 per person! I also stopped buying things in bulk. I know that buying in bulk is cheaper in the long run, but it was costing us a lot of money each time I went shopping; and I found that most of the time, we didn't use the bulk items very quickly, so they just sat around for a long time. I decided to start buying only what we would use in a single week. I always check the sales at Kroger and plan our menu based on what sale items I can combine with digital coupons. By combining sales and coupons, I was surprised at just how much money I could save. Spending under $120 per week in groceries was not nearly as difficult as I thought when I took the time to plan out our meals and check the sales. I make a lot of casseroles and skillet meals, which makes a little meat go a long way. Instead of each person having a portion of meat + side dishes, I make meals where the meat is combined with the other ingredients (I also make meatless meals a couple of times a week). I especially love to use ground turkey (we prefer the flavor and texture of the turkey over beef) because it's so versatile in so many recipes! 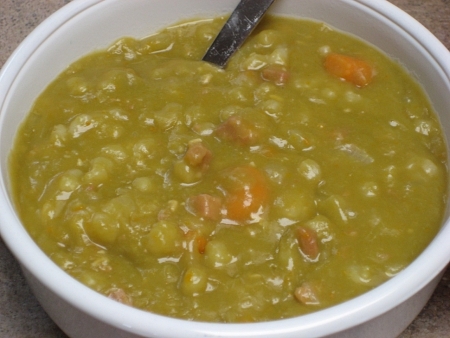 I would say that MOST of the recipes on my Recipes page are on the cheap side! I also went into more detail about how I grocery shop now on my budget, which you can find on this post. *We sold things that we weren't using. To earn a little extra allowance money, we pulled out some things that we weren't using (a Keurig coffee maker, for example) and we listed them on Facebook garage sale pages. We sold things really quickly and easily that way! We used a lot of this money for extra spending money on vacation. *I've always loved thrift shopping, so it's nothing new for us to buy our clothes from Salvation Army or other thrift stores. But we even saved money in this area by not buying things we didn't need Yes, I would love a reason to buy new (thrift) jeans, but I have a LOT of jeans already--I really didn't need more, even if they are only $2. So now, the only reason I go to the thrift store is if any of us truly needs something. *We take advantage of fuel rewards when buying groceries. We earn double fuel points for shopping on weekends, so I do my grocery shopping on Fridays. We are able to get up to $1 off per gallon of gas per month, so Jerry and I try to time our fill-ups so that we can go together with our cars and fill up--saving up to $1 per gallon of gas. That saves us about $20-30 per month! *We stopped going out to eat. One meal for the four of us at a decent restaurant can cost almost as much as a week's worth of groceries! We went a few months without eating out at ALL, and then we were very selective about when/where/why we did it. Once we added in the family fun money, we are able to go out once or twice a month, or we order pizza and have a movie night at home. But other than that, we don't eat out much at all. *I canceled our Sam's Club membership. I was able to get a $40 refund on the membership itself, but I knew that every time I went to Sam's Club, I was spending hundreds of dollars. Literally! Buying in bulk and then adding on a few impulse buys while shopping usually meant spending $200-400 each time I went. So, I canceled the membership, and I don't regret it at all. The small savings we got by buying in bulk wasn't worth spending so much at a time and it certainly didn't make up for the impulse buys. *I no longer buy things just because they are on sale. It's really hard to resist a fantastic sale, but I've started asking myself if we are really going to eat/use/wear it, and most of the time, the answer is no. Just because something is deeply discounted doesn't mean we need to buy it. *We utilize the library to our full advantage! Our library system is awesome--they have computers with internet, so if we needed to, we could cancel internet and just use the library's (as a blogger, though, the internet at home is pretty much a necessity). We can check out books ("real" books, audiobooks, and ebooks), DVDs (movies and TV shows), music, newspapers, magazines, and lots of other free things. There really isn't any need to pay for media with such a great library system. A frequently asked question: How do you start the Zero Sum Budget if you don't have any money saved up to start the first month? Jerry and I were very lucky in that when we started our budget, it happened to fall just after a month of an unusually high income for us. I had written a sponsored post, Jerry worked a lot of overtime, and there was an extra pay period (five Fridays instead of four)... the stars just aligned for us that month and we had enough to start our zero sum budget with our bare bones money in the account. 1) I would write out a bare bones budget, just like you would anyway, and stick with it as closely as possible. 2) While you are building up the bare bones savings, I would probably cut the allowance budget in half or less, and eliminate things like Netflix, Hulu, and any other unnecessary expenses for a couple of months. 3) It would also be a good time to sell some things you don't need. Take that money and put it in the bare bones savings. I spent a ton of time cleaning and organizing my house, and while I was doing that, I came across lots of things that I could sell. 4) Try to spend as little as possible on food--use up what is in the cupboards and fridge, getting creative and living minimally to add the money saved on food to the bare bones account. I would definitely stop eating out (this budget has made me SO aware of how expensive it is to eat restaurant food). I would also eliminate the food that isn't necessary--flavored or bottled water, tea/coffee, alcohol, snacks, etc. I actually did this for the first couple of months of our budget until I settled into a comfortable plan for groceries. 5) Don't go to the store unless it's absolutely necessary--it's so easy to buy things impulsively. By doing these things, the bare bones savings should add up pretty quickly. In a nutshell, I would just spend as little as possible, saving anything extra, until you have enough to start the month with the "bare bones" amount in your account. It may take a few months, but you're still making progress. And once you have that amount, everything will feel much smoother. I think that about sums up our debt payment! The 14 months flew by, and our budget quickly became a lifestyle once we developed a system that worked for us. The whole family loved having an allowance, and I found that my stress level went WAY down when we started each month with the money that we would need for the whole month. The whole family learned the value of a dollar (the kids have learned just how expensive an ice cream from the ice cream truck is now that they have to use their own money for it). I think the budget has been a good example for the kids, so they can learn not to spend money they don't have. And I loved being able to go on a fun family vacation this year without accumulating a single dollar of debt! Our whole entire debt repayment and budget all boiled down to one thing: planning. We have plans for every cent we earn; and to buy the things we want, we have to plan how we're going to do that and where the money will come from. Now that we're credit card debt-free, we're dreaming up plans for the future (before, we always had this debt looming over our heads, and we never really imagined that we'd be free of it someday). We are still going to continue our budget plan. I've really enjoyed the lifestyle that we've been living since we started the budget, which sounds odd, but because we worked the budget to fit our lives it was much easier for us to follow. Now, we are going to apply our extra money to our Jeep loan and get that paid off, hopefully within a year. I can't even describe the relief we feel about not having a debt looming over our heads! 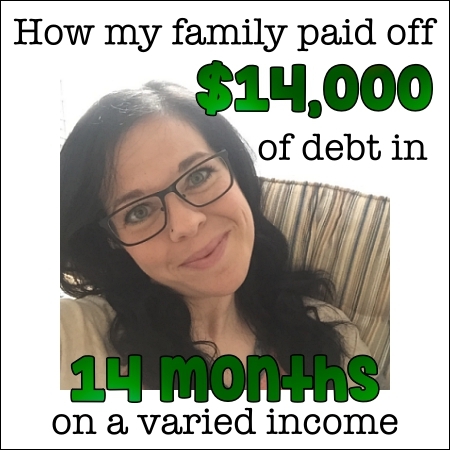 I would love to read about others who have paid off debt, and what worked for YOU... so feel free to leave a comment! That is so awesome you were able to pay off all your debt so soon. I always see the articles pay off 30 grand in debt in less than a year and read it to me bummed that it's not a realistic plan. I agree! When I read those sorts of articles, I gave up before I even started because it was so overwhelming. Just like with weight loss, I wanted to make something work for MY lifestyle and that I could do for the long-term. I love this post! I've been following for awhile now and I'm amazed you were able to pay off this debt in such a short time. What do you plan to do now? What do you plan to do with the "extra" money that you will have each month, that used to go to the credit card debt? You should see if Total Wireless is available in your area. It uses Verizon towers but is way cheaper. Family plan with 3 lines and 20GB shared data runs under $90 a month. You can use your current Verizon phones in most cases and there is no contract. It sounds intriguing! We have four phones with Verizon, and (as you can see) it's crazy expensive. I'm going to check this out and see if it's an option for us! We went with Metro PCS and got 5 lines for $125/month with unlimited data. I was with Verizon and it was killing me. Metro PCS is fabulous and uses the T-Mobile network. So helpful! I appreciate you writing it all out like this! A few questions -- do you save for big ticket items (ie vacation) in the Savings #2 account? And do you save for college or retirement at all? Good questions! Yes, we save up our vacation expenses in the Savings #2 account--since that account is one that we don't touch at all, really, we will add money on top of the $1000 for things like vacation (when we got our tax refund, we deposited it in that account, since we had plans for that tax return money and we didn't want to "accidentally" spend it). I'm proud of you (even though you don't know me)...1) for seeing the importance of getting rid of the debt in the first place, 2) for finding a plan that worked for you that you could truly stick to, 3) and for sharing your process, tips and tricks, and success with us. Even if someone can't make all aspects of your plan work for them, I think there are definitely pieces and parts and individual ideas that anyone can use to help themselves out of debt. Thank you! Thank you! 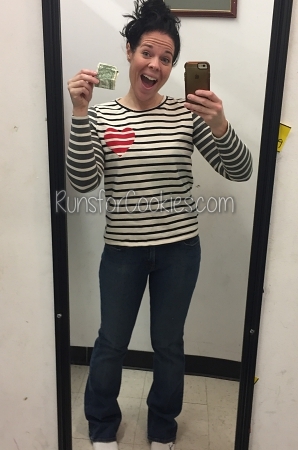 I'm clearly very excited about it ;) I found (through weight loss) that I don't do well with cookie cutter plans, and I have to make them work for ME (something that I can do for the long term). And these changes we've made have been just that. It's been great! This just looks like such an amazing plan. I've been trying to follow along but I'm still slightly confused. The "bare bones" part is what confuses me. So I should start with $0? Also, do you have a pet budget? We adopted a dog recently and she cost way more than I thought! Lol. I feel like I need a monthly dog allowance too. I appreciate your in depth post though! And I'm also curious (if you don't mind sharing of course) what you're planning on doing with your extra money now? The "bare bones" budget is everything that you will need for the whole month--all of your bills, groceries, gas, medical expenses, and other things that you need to pay for each month. Anything on TOP of that number is what gets paid toward the credit card. I don't have a pet budget, although I probably should. When we need dog or cat food, and cat litter, I buy it at the grocery store, so I just count it in with our groceries. But I just took Phoebe to the vet and it was $150! So that comes from our "extra" expense category (which we budget $400 per month for). Thank you! I think I'm going to sit down with my husband and work this out. I really think it would help us. We need some kind of budget. Great idea to pay off the Jeep! This is amazing and super inspirational - thank you so much for sharing!!! My husband's favorite saying...you aren't saving money if you are spending it. Buying stuff on sale is still spending. Of course I load up on the stuff I would buy anyway when it is cheaper and try not to buy it at full price, but a lot of people get caught up spending money they don't have "because it was a good deal" (ie. your $2 thrift store jeans). I honestly don't go shopping much unless I have a specific thing I am shopping for. Otherwise I end up buying crap I don't need, won't wear, etc. Congrats on getting to this milestone and keep up the great work towards the next one! Way to go! Congrats on your accomplishment! You have inspired me to get myself in gear and get our debt paid down! This is so great!! I paid all my debt off a few years ago using Dave Ramsey’s plan....without paying for the actual course. After I got all my debt paid, I had only my mortgage for 7 years, but I finally bought a new car in March. It was exciting but excruciating to let myself have ANY debt again.....but it’s ok....the new car is fabulous and I had a large down payment and will pay the balance as quickly as possible!! I truly wish everyone would do this!! If they only knew the freedom it brings to be debt free!! So excited for you guys, when a family has a handle on the $$ & budget everything runs better! Great job! I am so happy for you all. We have lost our focus and I really want to try a 0 sum budget. We paid our credit card debt but still have a student loan and now have a preschool payment. I want it all paid off so we can get our 6 months of savings in the bank. Thanks for the inspiration. This is fantastic. Aside from reducing your debt and getting your household budget under control, you are modeling great financial practices for your kids. I love how you've gotten them involved and invested with th process. This is something that's going to serve them well as they grow up. I'm so incredibly impressed with all your planning and how you are sticking to it. Thank you for sharing! I have never heard of the zero sum budget but I am so intrigued since our income also varies! Also, I'm super jealous that your house payment is $500!!!! How is it so low?? ?